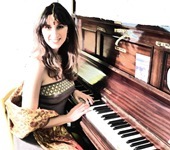 Giusy Caruso is working as an Artist Researcher at IPEM - Institute of Psychoacoustic and Electronic Music - at the Department of Art, Music and Theatre Sciences of Ghent University (Belgium) in affiliation with the KASK - School of Arts of Ghent - Royal Conservatory. She is also a reviewer for the journal Cahiers Internationaux de Symbolisme (University of Mons). 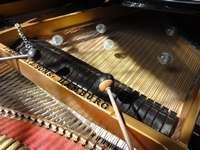 The artistic research project proposed by Giusy Caruso involves an investigation on her piano performance practice of the 72 Etudes Karnatiques pour piano by the French composer Jacques Charpentier (1933) while embracing the sphere of embodied music cognition, specifically the correlation between intentionality and musical gestures. The challenge is to examine how in musical interpretation the cultural background and the practical experiences lead the performers’ intentions, expressive sensitivities and gestures, assessed in this case study through the implementation of South Indian Music competences (i.e. Karnatic Music) as a complementary Western hermeneutical tool.By interweaving a phenomenological approach and a Motion Capture analysis, the aim is to investigate gestures as vehicle of musical intentionality. Caruso et al., (2016) Gestures in contemporary music performance: a method to assist the performer’s artistic process, Contemporary Music Review, (Status: in publication). Caruso G. (2016), Musical Gestures as the Interface of performers’ intentionality: a case study on Western Embodiment of Karnatic Music, in Music Gestures as Creative Interface, Conference Universidade Católica Portuguesa, Porto (Portugal). 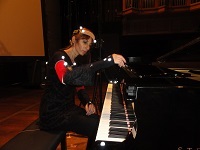 Caruso G. (2016), My soul at my fingertips – My Avatar and Me, in Performance, Subjectivity and Experimentation in Artistic Research, Orpheus Institute of Ghent (Belgium). Caruso G (2016)., My soul at my fingertips – My Avatar and Me, in Codarts Artistic Research Festival CRAFT, Rotterdam (Holland). Caruso G. (2014), Western Embodiment of Karnatic Music, University of Bangkok (Thailand). Caruso G. (2013), Western Embodiment of Karnatic Music, in IPEM 50, University of Ghent (Belgium). Caruso G. (2013), Western Embodiment of Karnatic Music, in International Orpheus Academy, Orpheus Institute, Ghent (Belgium). Caruso G., Renzo Cresti: “Ragioni e Sentimenti, nelle musiche europee dall’inizio del Novecento a oggi” - Lucca, LIM, (Biblioteca Musicale Lim - Saggi), 357 p. - Cahiers internationaux de symbolisme, Université de Mons. Caruso G., Marc Leman: “The Expressive Moment, How Interaction (with Music) Shapes Human Empowerment” - The MIT Press, Cambridge, MA. 2016, 256 p. - Cahiers internationaux de symbolisme, Université de Mons. Caruso G., Ana Opiela : “La Musique dans la pensée et dans l’œuvre de Stendhal et de Nerval” - Paris, Honoré Champion, collection "Romantisme et modernités", 2015. EAN13, p. 336 - Cahiers internationaux de symbolisme, Université de Mons. Caruso G., Biagio Putignano: “La Musica Intorno – Scritti di musica” - Bari, Florestano Edizioni, 2015, 90 p. - Cahiers internationaux de symbolisme, Université de Mons.